Most of us know that we need to socialize our pups. But did you know that socialization needs to start early? And that it is critical to socialize your pup before he or she has the full set of Parvovirus and Distemper vaccines? 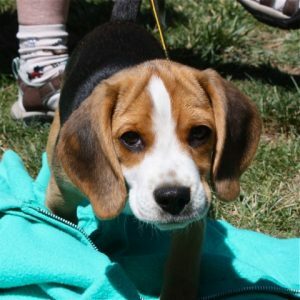 So how can you safely socialize a pup before he is fully vaccinated? Invite friends to your home. Children, adults, men, women, the UPS driver, the gardeners—have your pups see and experience these people in and around your home. Take your pup to a friend’s house. Just going into a new environment will offer your puppy lots of new experiences. Introduce your pup to healthy, vaccinated, and puppy friendly dogs. Your pup doesn’t have to play with everyone (though it is great if he does), just having them around is important. Be sure your pup meets your cat and other animals that he will need to be comfortable around too. Gentle exposure can help your pup learn that they are not something scary! Take your pup on a walk in a stroller, wagon, or sling. Just don’t allow him to walk place that there might be other animal’s urine or feces. Take a large blanket and an exercise pen to the park. Let your pup watch the world go by on the safety of the blanket. Take your pup for car rides. Help him get used to the motion on short rides to the store or even just around the block. Stop by your vet’s office and get your pup weighed. Take along plenty of treats to make it a super great experience. Visit a store or café. Carry your pup in and let him take in the sights and smells. Expose your pup to regular household activities. The vacuum, the rake, TV, and blow dryer. Gently expose your pup while he is enjoying a stuffed Kong or another great chew. Consider taking a puppy class. A well run puppy class takes precautions to help protect against diseases and will help you socialize your pups to things outside of your home while your pup is also getting some foundation training. It is the quality of the exposure that counts (not the quantity!). Your pup doesn’t need to have prolonged or close contact with new things or people. He just needs to have easy, happy, experiences. The more relaxed your pup is, the better. Help your pup be relaxed and calm. Hold him in your arms if that is calming. Talk to him in soft and gentle tones. Give him treats. Keep him a little bit away from things so he can watch from a comfortable distance until he is ready to explore.